HUNTSTVILLE — It’ll be a “surprise” concert Saturday night for the Good Lovelies and their fans. Join the Good Lovelies Saturday, Feb. 9, for a live-recording concert. So says Sue Passmore, a member of the popular country/folk/pop trio performing at the Algonquin Centre here in Huntsville. According to their website, after more than a dozen years playing and touring and performing about 1,000 concerts across Canada, the U.S. Australia, Europe and the UK, they will record their second special live concert for YouTube use and hopefully eventual album release. “This is something we have been preparing for more than a decade – it’s going to be a very special night and one we will always remember. We’d love for you to come and be a part of something that will be viewed by people around the world. Come and add your voice to the recording. Help us capture this special moment in time. Fans can definitely expect songs from a year ago’s hit CD, Shapeshifters, Passmore said in recent phone interview with MuskokaTODAY.com. But the surprise — to both — will come as they prepare their set list. Passmore said it will be a lot of covers of bands and artists the three young women admire and who have inspired their joyful all-Canadian small-town sound. Passmore, Kerri Ough and Caroline Brooks, who all grew up and again live east of Toronto centred around the small communities of Cobourg/Necastle with their young families, have recorded four albums, two EPs, a live album and a Christmas record. From their rural Eastern Ontario coffeehouse roots they have grown and are transitioning to more mainstream pop. Thus last January’s Shapeshifters, which included the surprising Take Me, Take Me. 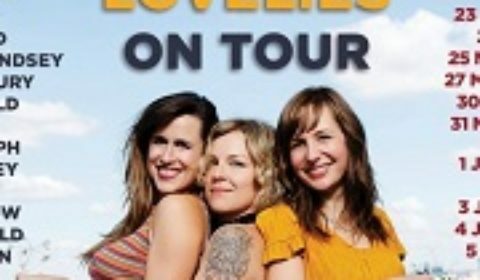 The Good Lovelies Caroline Brooks, left, Sue Passmore and Kerri Ough will be recording at the Algonquin Theatre Saturday night, Feb. 9. It wasn’t what they went into the studio in 2017 to produce, but once they got there, their new electrified and confident sound emerged. One that has become animated and personally expressive. But she says they always keep a stand-up bass on stage to keep them grounded and remind them of whom they really are and where they come from. Joining Passmore (guitar, percussion, vocals), Ough (keyboard, banjo, guitar, vocals) and Brooks (electric, acoustic guitar, vocals) for the night will be bassist Steve Zsirai and drummer Mark Mariashi. The group, which is up next week for a Folk Alliance International Award in Montreal, is a collaborative effort by the three good friends. Passmore, who has a music degree from York University, got her singing start and a large part of her musical influence while performing as a young choral member of a local choir led by director Marie Anderson. It’s also where Passmore’s world began to be shook up by percussive sounds, which are a driving part of the Good Lovelies’ moving backbeat. Along with R&B. She also loves Nicole Akins and Leon Bridges. With Ough having just moved back in January from the busy East Coast music scene, she returns to her band mates the influences of some Celtic sounds that are certain to worm their way into their sound. “It’s exciting,” says Passmore, as they look forward to a two-month 23-date European tour starting April 4 in Mylor, England, and including London and Glasgow and wrapping up in Geldrop, the Netherlands June 5.